This is the third in a recent series of articles at The Book Chook about poetry and children. The first was Poetry with Kids - Ideas and Resources, the second was Poetry with Kids - Creating Haiku. Next week, the final in this series is Poetry with Kids - Presenting Haiga. What's a haiga? Basically it's a combination of two things: words in the form of a haiku, and an image. Traditionally in Japan the image was a brush painting, but nowadays it's more commonly a digital photo. Thus haiga combine two of my favourite things, words and images. Just as a haiku is an accessible poetry form for kids because it's short with a restricted format, so too is a haiga. 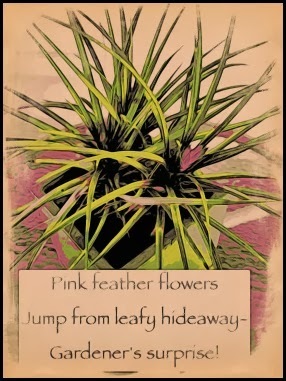 Once kids have grasped and practised the haiku format, have them think of ways to use an image to complement the haiku. Those images may come from physical artwork, and children can simply write out text and add it to their art. Physical art work can also be scanned and converted to digital. Or kids can take photos themselves, perhaps by going on a walk with a digital camera. 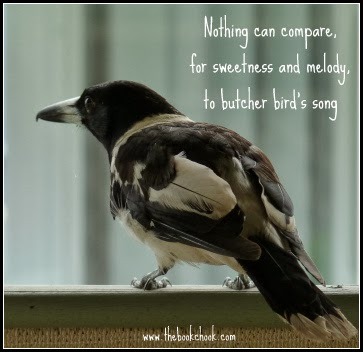 I created a haiku about a butcher bird (just above) after I captured a pic I was pleased with, then converted the two into a haiga. Children can also source Creative Commons-licensed pics online, or create them via apps. You can see some examples where adults have done this in an issue of Haiga Online dedicated to play, and I think the image for this haiga was created at Bomomo. 2. Next, I downloaded the text-adding app, Phonto, to my iPad and went outside for a photo walk. Since haikus are usually about nature, I wanted to walk around my garden with my eyes open for photo opportunities. Once I had a range of pictures, I looked at them and searched for inspiration. I chose a picture and checked my format again - 3 lines, five syllables in the first line, then seven, then five. 3. I created my haiku based on the image I chose. 4. I added the haiku to that image, using Phonto, which is an app that very quickly and easily lets us add a range of fonts, colours and styles to our text, then text to an image, with the option to share via email, save to camera roll etc. Phonto also allows us to open the resulting image in another apps. I finished the haiga just above in iPad app, Moku Hanga, after creating it in Phonto. 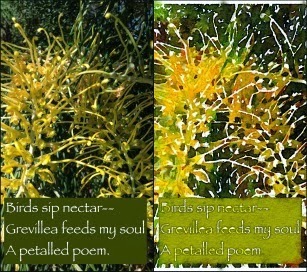 The image below shows a haiga I began in Phonto on the left, then the same image rendered in iPad app, Waterlogue on the right. You don't need to have an iPad or Phonto for this activity. Many online image editors will allow you to add text to an image e.g. Ribbet, as well as software like Photoshop or Skitch. A camera can be used, or kids could draw/paint and scan their images. It doesn't need to be a photo either. Kids could also use some of the fun digital tools I mention in Fun and Easy Ways to Make Digital Art with Kids to generate a digital image. 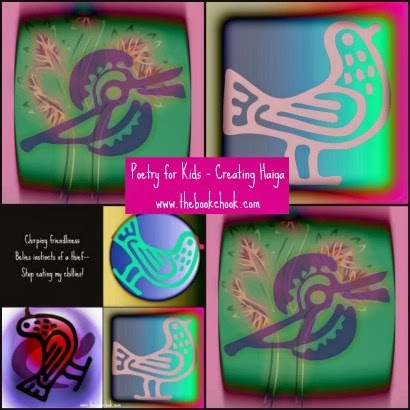 Check out the image editors I mention in Book Chook Favourites - Online Image Editors and Make your Own Mandala or Creativity and Play. 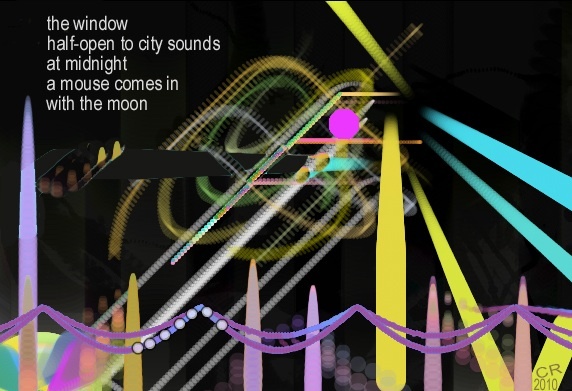 Even a screen grab from a website that's encouraged kids to interact creatively might make a great start. Toy Theater has some nice art tools kids can use to generate an image. The Japanese Print allows them to colour a Hokusai wood block print which I think makes a nicely authentic background image for a haiga. Scrap Coloring has lots of templates kids can colour digitally, many with images from the environment. Below is an example of a haiga I created in Mutapic, then finished by adding text to a Ribbet collage. 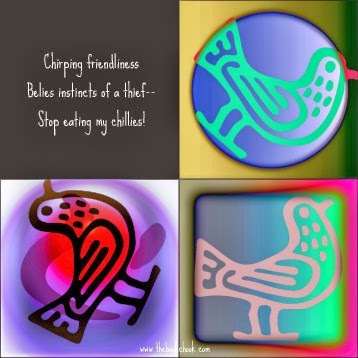 Birds stealing my chillies is something very much on my mind at the moment, so the urge to write about it came first. But sometimes children will prefer to create an image and use it as a prompt for their writing. I believe it’s whatever works for you. Combining poetry with images can help bring poetry alive for kids. If the restricted format of a haiku doesn't work for them, you could try encouraging them to add just words, phrases, or text in the form of imagery to a picture. Activities like these motivate kids to play with language, and develop literacy skills they need for school, and for life.